It’s officially the 1st of May, and you know what that means – it’s BEA month! And along with BEA, we - Katelyn from Kate's Tales of Books and Bands, Andrea from The Overstuffed Bookcase, and Jen from YA Romantics & I – are bringing back the BEA Book Blogger Picnic for the second time! So, a short background: Andrea came up with an awesome idea to get book bloggers together for a little gathering where everyone could meet and chat. As soon as all four of us formed our little team, we organized the picnic – and it was so fun! We had a great turnout last year, and are looking forward to seeing more of you this year too. This year, we’re making the event even more special – by hosting TWO, one on Friday and one on Saturday! That way, more of us can come together to meet and chat. If you’re in NYC or will be in NYC during BEA and you’re a book blogger, you are officially invited to the 2014 BEA Book Blogger Picnic and the 2014 BEA Book Blogger Meet and Drink! WHAT: We’re hosting a picnic again this year! There will be snacks and drinks, and we aim to have it be a low-key, relaxed get together for all of us book bloggers to meet, chat and hang out. WHO: ALL book bloggers are welcome, whether you're attending BEA or not! WHERE: The lawns outside Heckscher Playground (see map below) near the SW corner of Central Park in NYC. Look for me, Andrea, Katelyn, and Jen in bright pink BEA Book Blogger Picnic shirts! WHEN: Friday, May 30, 6-8pm. This is a come-and-go event, so it's okay to come late or leave early! OTHER THINGS OF NOTE: Bring your own food (if you want), and books to exchange (which happened spontaneously last year! And only if you want, of course!) and meet us at the lawns outside the Heckscher Playground! Here's a map of the SW corner of Central Park. 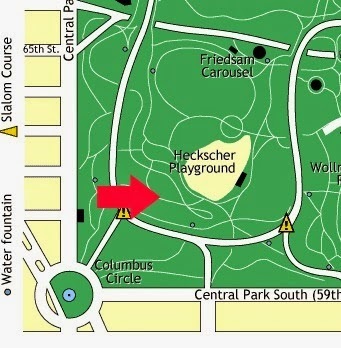 If you go into the park from Columbus Circle, you should be able to find us pretty easily, since we will be between Columbus Circle and Heckscher Playground. Be sure to look for us in the bright pink shirts! We may also have a sign. Follow #BEABloggerPicnic for info and updates! WHAT: We’re hosting happy hour this year, so that book bloggers can get together to meet, chat and unwind with a couple of drinks. WHERE: Tir Na Nog Irish Bar & Grill, 315 W 39th St., between 8th & 9th Ave. There are two Tir Na Nogs in Manhattan, so make sure you go to the one on 39th! We will be in the front bar area, but just ask for the book blogger group if you're not sure where we are! WHEN: Saturday, May 31, 8-10pm. This is a come-and-go event, so it's okay to come late or leave early! We can also hang out there later if people want to stick around after! Follow #BBMeetandDrink for info and updates! We are so super excited to host both of these events this year! Please feel free to grab any of the graphics in the post to share on your blog, and other social media sites.And please spread the word! Feel free to tweet with #BEABloggerPicnic and/or #BBMeetandDrink, share the event on Facebook, add the graphics to your sidebar, write your own post, whatever! Be sure to follow #BEABloggerPicnic and #BBMeetandDrink on Twitter for any news and updates, and you can follow all the organizers as well: @alexalovesbooks, @JenRyland, @KatelynTorrey, and @OverstuffedBook. Also, if you plan on coming, leave a comment below, or send us a tweet with #BEABloggerPicnic or #BBMeetandDrink and let us know! Come to one, or come to both! So sad to miss out this year -- it was so fun to meet new people last year. Have a great time! YAY! I can't wait for this night. I love that there's an official after party as well. Maybe we'll catch a taxi together again from the Post Office :). Thanks for planning this! YAY!!!! I'm so freaking excited for this - the BEA Bloggers Picnic is part of the reason I wanted to go to BEA this year. I haven't met any of my favourite American bloggers yet (like you, Alexa, I've been lurking for so long! ), so I'll probably be introducing myself left, right and center - I hope shyness doesn't get the better of me. I couldn't access your map - any chance you can repost? Yay! I'll be there! This will be so much fun!!!! I am so excited to meet other bloggers! I'm so excited that I will be able to make it this year!! :) Very cool that you guys set up 2 events! Ash and I will def be at the picnic again this year! I would love to go to the meet and drink but we'll probably head home after the conference on Saturday. So excited to see you again! Bummer, not sure I can make it. I always attend with my family so we have dinner plans/reservations every night. Despite being in the middle of other buildings, you get breathtaking views of the city across the way as well as a view of lower parts of the city during the evening and nighttime. Sounds fun! I hope to be able to stop by! I'm going to try to come to one or both! Might bring my sister who I'm staying with along as well. I blog at Lisa Loves Literature. Not hearing much discussion about MediaTemple? Are they not the first choice when considering cheap web hosting? Anything I should be aware for MediaTemple?